My client called a couple of weeks ago and told me they were changing her daughters' room and wanted another window. Her daughter loved the Eiffel Tower that I had painted on the window and wanted to incorporate it into the new window. My client loved it and I had a lot of fun doing it! That is beautiful. If it's not a rude question, what kind of inks do you use for painting onto glass? WOW! Stunning!!! I love it, and I'm sure your clients daughter will be over the moon about it. You are amazing. I looked at that fabric and thought, hum what will she do. And then, the photo. You totally nailed and then some. Just wonderful! What a lucky girl. I love this idea of painting on an old window! Great! you are incredible! talent and quirk! Just beautiful! I too am wondering what kind of paint you use if you don't mind telling. I have a few windows I'd like to paint on and was going to do a little research on my different options. The fact that the flowers are in front of the tower is just fantastic -- what a lucky little girl to have this in her room! Oh wow! This is soo cool!! This is so beautiful. I linked in a simple lunch dish to Live.Laugh. Rowe's linky party. Have a great week. You have reason to blag, girl! WOW!! So talented... thank you for sharing! Came over from Happy Hour. 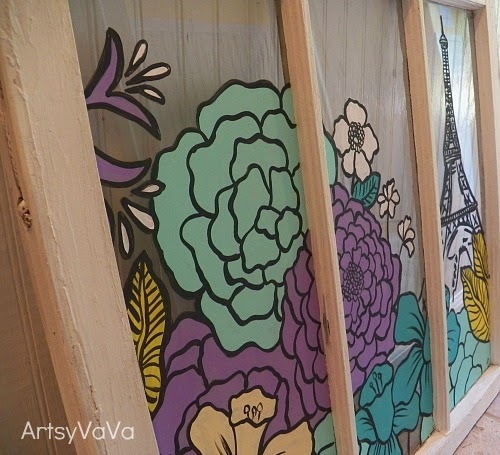 I also paint windows. I was wondering what you used to seal the paint. Love the design! Beautiful art work, TFS. Just hopped over from Katherine's Corner blog hop. What a wonderful personalized piece of art! wow. You are so talented! Love the neat painting and the design is fabulous. Thanks for linking up at Friday Fun Party. Have a nice weekend! 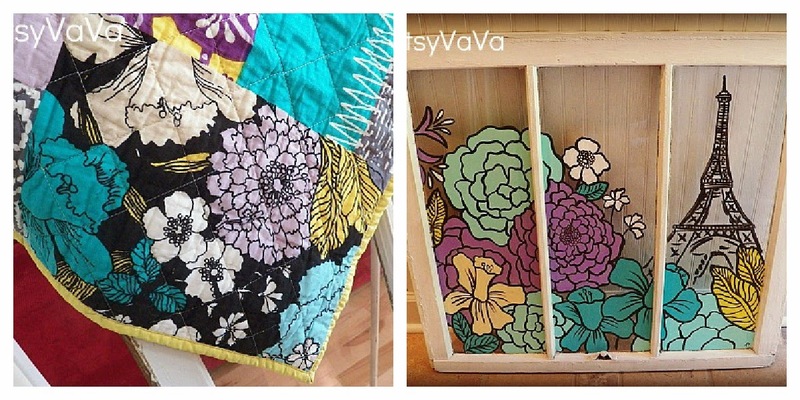 You did an amazing job incorporating the exact flowers that are on the quilt. Love how the Eiffel Tower is nestled behind them. Love it! Thanks for sharing your talent with Share Your Cup. That is so beautiful. My daughter would be thrilled with artwork like that. LOVE this! Such beautiful work! Thank you for sharing! I love this! 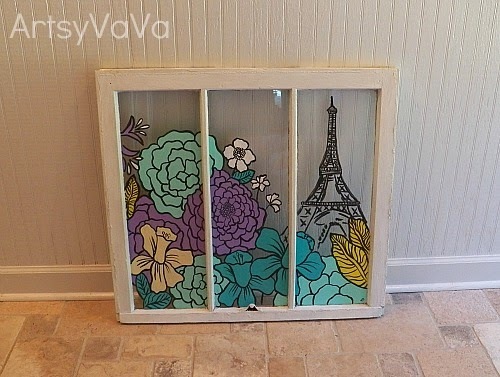 You've inspired me to do something beautiful with the old window sitting beneath my deck. 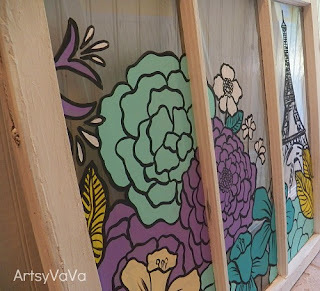 I want to paint a design on my front door windows was thing of using acrylic paint because it will wash off if we move is that what you used? This is so gorgeous! I love the colors that you used! Thanks for sharing how perfect does the painting match the bedding. 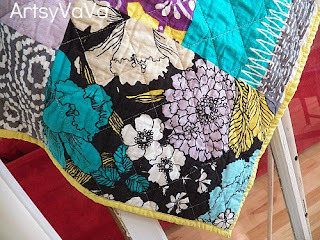 Stopping by to say Hi from the blog hop. Come visit sometime, tea is cold and no shoes are required. 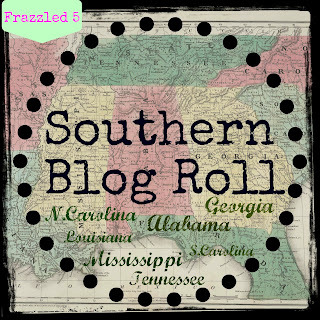 Kathy B. http://www.southernmadeintheshade.blogspot.com New follower. It looks Fantastic and gorgeous! beautiful artwork. Just stopping by! Looks amazing, I love this design! I've seen your window art on several of the parties I'm working on linking up to today. It's really quilt nice. I particularly love the look of the new window. This is awesome! I am featuring it tomorrow! 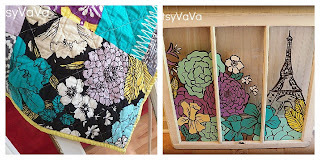 Thank you for sharing with us on A Crafty Soiree, I've featured your project this week. Please come by and see if when you get a chance. This is just beautiful! 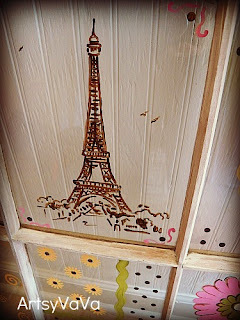 I am doing a Parisian theme for my little girls nursery as well. I just love this! I am a new follower. I love your slogan as well. "I get excited and make stuff!" That is how I feel too. Love love love it! Can't wait for more! 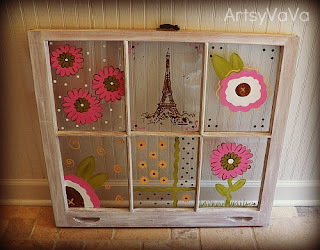 Thanks for sharing over at Craft Junkie Too….this project is part of our featured favorites this week. :) Stop by and check it out and link up more goodness. 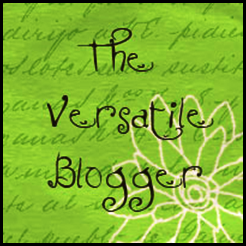 Also, you can grab the featured me button for your blog if you'd like. 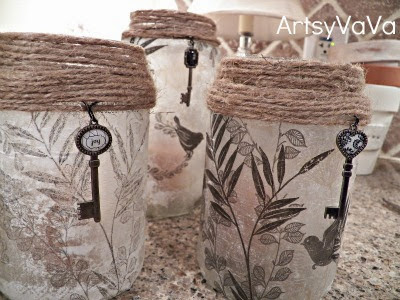 and with your permission feature these in a post on my interior design blog over the next few days..
As always I am totally impressed! 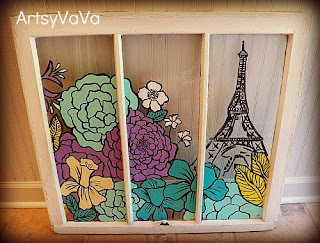 I think that I should just devote a corner of my blog to Artsy Vava love! Oh that's lovely! I'd love to try something like that! 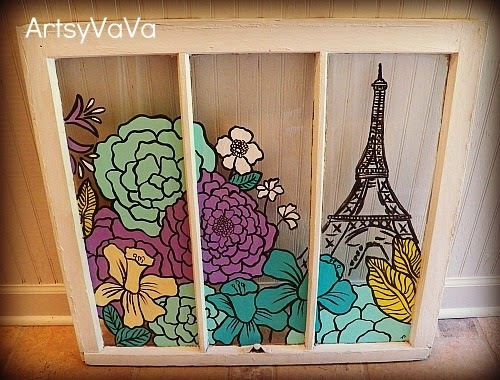 What a lovely window, Virginia! I am totally pinning this! thanks for sharing, girl.